The FANG" stocks should include an "S" for Square, Nomura Instinet says, because of the payment company's disruptive potential. The firm has a $125 price target and says Square is still a more attractive buy than its payment peers or FANG stocks, despite a 200 percent climb year over year. Square could rattle the payments industry in the same way Facebook, Amazon, Netflix and Google shook up other traditional markets, according to one analyst. Because of that potential, Nomura Instinet is advocating an "S" for Square be added to the high-growth "FANG" group. "Similar to FANG stocks that have disrupted traditional markets with massive global TAMs [total addressable markets], SQ's fully cohesive solutions and rapid rate of innovation suggest that it is en route to disrupt the global payments ecosystem," said Nomura Instinet analyst Dan Dolev. FANG is an acronym for high-performing technology stocks — Facebook, Amazon, Netflix and Google parent Alphabet — that have led the record-breaking bull run of the last nine years. Dolev said Square's rapid growth from large sellers, "improving market efficacy," Cash App investments and massive growth in downloads back up his $125 price target. The stock was up 9.3 percent to above $94 on Tuesday. "But is SQ too expensive? 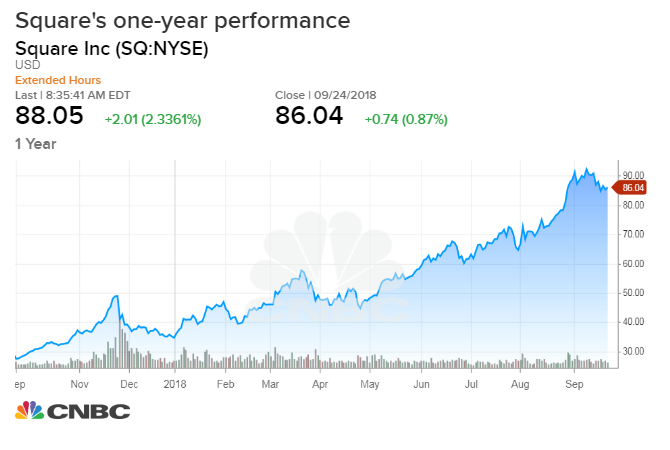 Not when taking into account its stellar 45% expected three-year revenue CAGR [compound annual growth rate], which makes it screen more attractively than many payment peers and FANG stocks, in our opinion," Dolev said. Square Chief Financial Officer Sarah Friar said at Recode's Code Commerce Conference in September that the start-up is considering "lots of ideas" for the Cash App, like saving products and a way to let customers trade stocks. The popular peer-to-peer Cash App, which had a breakout second quarter, is growing faster than PayPal's Venmo, according to another Nomura report. The San Francisco-based company, headed by Twitter CEO Jack Dorsey, is best known as a credit card processor but also offers payment hardware. Square has also upped its presence in small-business lending through Square Capital and partnered with eBay in July.